India ranks a lowly 66th out of 142 world economies as per the latest rankings released by Global Innovation Index. The rankings into its sixth edition puts Switzerland on the top of the list. The core of Global Innovation Index (GII) consists of ranking of world economies’ innovation capabilities and results. The rankings are arrived by calculating average of two sub-indices – The Innovation Input Sub-Index & The Innovation Output Sub-Index. Though India is ranked quite low at a global level, if we look at rankings from country income levels, India does quite well ranking second among countries with lower middle income range. Generally, countries with higher income levels ranks higher than others on the index. the top 31 countries on GII are all from high Income level groups. If you consider region-wise ranking, India comes out on top in Central and Southern Asia region. Here are region wise rankings. Interestingly, the top 4 countries are all from Europe – Switzerland, Sweden, United Kingdom and Netherland followed by USA in the 5th position. USA has jumped 5 places from their previous GII rankings. The GII index finds that nearly all the emerging economies, including BRIC countries have seen a fall in their rankings as compared to 2012. India was ranked 62nd in 2011, and 64th in 2012, while this year they have dropped further 2 places to be ranked 66th. Other BRIC countries – China (35th; a decrease of one spot from 2012 and six from 2011), Russia(62nd; a decrease of 11 positions from 2012 and six from 2011), Brazil (64th; a decrease of six spots from 2012 and 17 from 2011) all of them have seen a drop in rankings. for the first time this year: the citable documents H index (23rd), the QS university ranking average score of top 3 universities (27th), high tech and medium-high-tech output (31st), GERD performed by business enterprise over GDP (42nd), logistics performance (46th), and patent families filed in at least three offices (59th), with a single weakness in royalties and license fees receipts over services exports, where it is ranked 83rd. India has also done quite well when it comes to FDI inflows related to R&D. Only six out of the top 20 countries for FDI inflow are from European countries; five are from India and three from China. 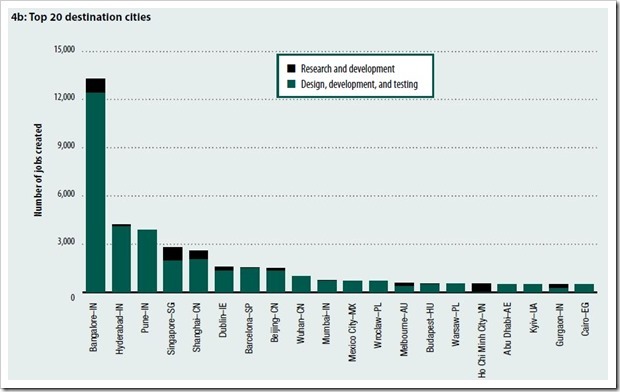 The top five destinations for design, testing, and R&D are Bangalore, Hyderabad, and Pune in India; Singapore; and Shanghai in China. Most of the jobs created are in design and testing, while a few are in R&D activities. "India Ranks 66th on Global Innovation Index, Tops R&D FDI Inflows! ", 5 out of 5 based on 1 ratings.